Rebecca Rusch is one of the great endurance athletes of our time. Known today as the Queen of Pain for her perseverance as a relentlessly fast runner, paddler, and mountain bike racer, Rusch was a normal kid from Chicago who abandoned a predictable life for one of adventure. In her new book Rusch to Glory: Adventure, Risk & Triumph on the Path Less Traveled, Rusch weaves her fascinating life's story among the exotic locales and extreme conditions that forged an extraordinary athlete from ordinary roots. Rusch has run the gauntlet of endurance sports over her career as a professional athlete-- climbing, adventure racing, whitewater rafting, cross-country skiing, and mountain biking--racking up world championships along the way. But while she might seem like just another superhuman playing out a fistful of aces, her empowering story proves that anyone can rise above self-doubt and find their true potential. First turning heads with her rock climbing and paddling skills, Rusch soon found herself spearheading adventure racing teams like Mark Burnett's Eco-Challenge series. As she fought her way through the jungles of Borneo, raced camels across Morocco, threaded the rugged Tian Shan mountains, and river-boarded the Grand Canyon in the dead of winter, she was forced to stare down her own demons. Through it all, Rusch continually redefined her limits, pushing deep into the pain cave and emerging ready for the next great challenge. At age 38, Rusch faced a tough decision: retire or reinvent herself yet again. Determined to go for broke, she shifted her focus to endurance mountain bike racing and rode straight into the record books at a moment when most athletes walk away. 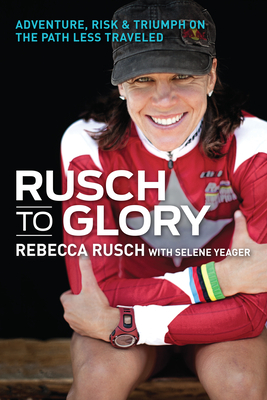 Rusch to Glory is more than an epic story of adventure; it is a testament to the rewards of hard work, determination, and resilience on the long road to personal and professional triumph. Rebecca Rusch won her fourth straight Leadville Trail 100 Mountain Bike Race in August of 2012. In addition to three 24-hour solo mountain bike World Champion rainbow jerseys, Rusch is the 2010 World Champion for Master's XC mountain biking, the 2011 National XC single-speed champion, and a three-time national champion in 24-hour team mountain biking. She set a new female course record for the 142-mile Kokopelli Trail in 2013. Rusch won Idaho's Short Track state championship (twice), and a Cyclocross state title. An accomplished Nordic skier, she's won the Masters Cross Country Skiing World Championship, in addition to taking the top prize at Raid Gauloises Adventure Racing World Championships. Rebecca also organizes a series of female ride initiatives called the SRAM Gold Rusch Tour, an event that combines race & training clinics at major bike events, female media camps and an all girls MTB camp in her hometown of Ketchum, Idaho.